The 10 Best BBQ Joints in Arkansas! Award-winning barbecue comes naturally in the Natural State. From smoky pork, to savory beef, to the most perfect slices of brisket you’ve ever laid eyes on, Arkansas’ best barbecue joints have exactly what you’re looking for. Here are our 10 favorites! Chain or not, this barbecue joint is off the hook! Since 2005, this world champion barbecue franchise has been serving Memphis-style barbecue at multiple locations in Arkansas. The meat at Whole Hog Café is hand-rubbed with a special blend of spices and then slowly smoked to create that famous, mouthwatering flavor. You’ll find award-winning barbecue that the whole family will love at this popular joint in Ozark. From smoked barbecue dinners and sandwiches, to meats by the pound, the menu at Rivertowne is full of unique flavor. Rivertowne BBQ uses its own dry rub and smokes its meats onsite daily. This barbecue joint has been a well-known landmark in Fort Smith since 1977. Jerry Neel’s is popular not only for its twice-baked potatoes, sliced brisket, and pork ribs but for accommodating large crowds and last minute catering orders as well. With popular menu items like “The BBQ Bubba” and “The Judges Platter,” Pink Flamingo’s is a must for all Arkansas barbecue -lovers in the River Valley. Pink Flamingo BBQ has five mouthwatering sauce flavors available for retail purchase at just $4.99 per bottle: original, hot, smokey, sweet heat, and extra hot. Allen’s BBQ Company has been cooking meat the old-fashioned way since 2002. The folks at this Arkadelphia BBQ joint put in a lot of long nights and days and have built this business one customer at a time. Popular menu items include barbecue nachos and pulled pork sandwiches. Best known for its famous barbecue sauce, McClard’s has long-been a Hot Springs favorite. McClard’s was established in 1928, giving it deep roots in Arkansas. From the beans and slaw to meat by the pound, everything on the menu at this popular barbecue joint will make your taste buds happy. Sim’s has been serving up some of the best barbecue and soul food in Central Arkansas since 1937. This local favorite is known for its barbecue sauce, available for bulk purchase, as well as for its specials like the Big Sim and the Sympathy Box. This spot specializes in ribs, sandwiches, and so much more! With three great locations in Bentonville and Rogers, there’s no excuse to miss out on this popular barbecue joint. For more than 25 years now, Smokin’ Joe’s has been a premier destination in Northwest Arkansas for genuine pit barbecue. You’ll love the fine southern swine at this barbecue joint in Forrest City. Delta Q has gained a reputation for being group and kid friendly, as well as for serving some of the best barbecue in the state. Popular menu items include the pulled pork sandwich, tacos, and salad. Folks have been impressed by this award-winning barbecue joint for more than 20 years now. 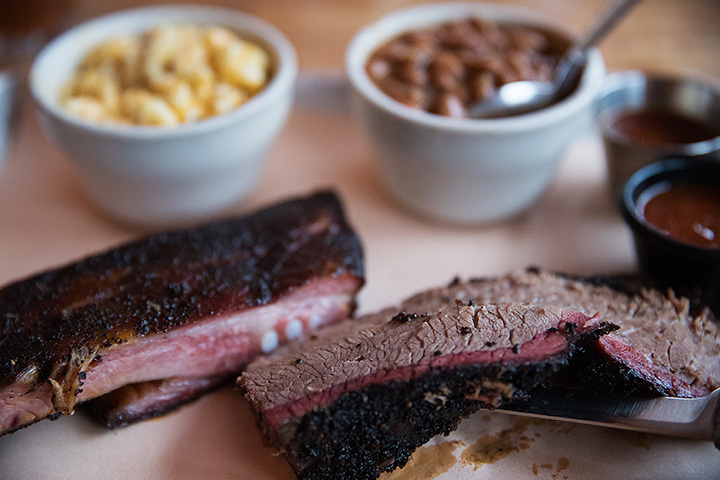 Using a slow, hickory-enhanced method for smoking meats, Penguin Ed’s takes pride in serving good barbecue to the Northwest Arkansas community. Penguin Ed’s has three great locations in Fayetteville.